A new survey is out today, European Perceptions of Climate Change (EPCC), on public opinion in the UK, France, Germany and Norway. It’s being talked about at an echo chamber conference, see the twitter tag #EPCC17. It’s also discussed in the Guardian. The authors include some of the ‘usual suspects’, Nick Pidgeon and Adam Corner. The polling was done by Mori, using mostly face-to-face interviews, in June 2016. According to Carbon Brief, Prof Pidgeon is “quite surprised” by this. 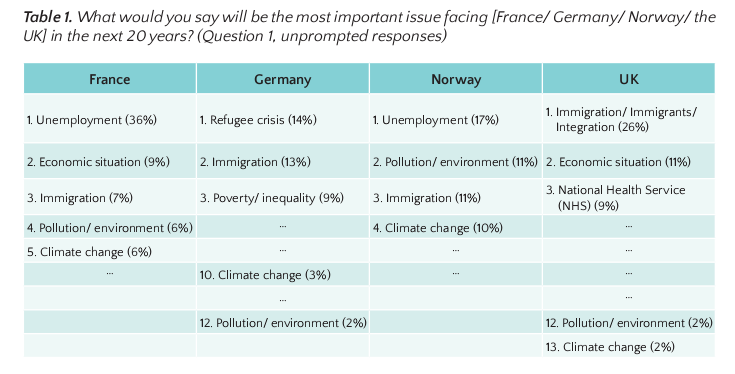 Among the other findings, most people are at least fairly worried about climate change, though in the UK we are not so concerned as people in the other countries. On causes, more people went for partly natural and partly human than chose mainly caused by humans. The survey also covered policy issues such as energy sources, subsidies and rising energy costs, and support for the Paris agreement (high in Norway, more lukewarm in the UK). The New Scientist has an odd take on the paper, telling us that 97% of climate scientists agree that more than 100% of climate change over the past 100 years has been man made. Oh, how unconscionable of them to release such “alarming” results on this day of all days. We should all be focussed on the dreadful plight of women of the world, many of whose future – according to UN-ocrats – depends inter alia on building more windmills and solar panels. Not to mention other “innovative”, “transformative” and “sustainable” solutions, such as bankrupting their countries’ respective economies. Surely what the world needs now is more platitudes, more slogans, more marches, more hashtags, more twitter-storms, more selfies and – of course – more placards and more $$ to the UN maze and/or its ever-increasing army of NGOs, the latter of which constitutes the only genuine hockey-stick the UN has ever produced. Seriously, though … I cannot say that these results are in the least surprising. Nor are they likely to be to either the UN or to its sister-in-arms, the EU. The New Scientist article mentioned by Tiny CO2, by one Michael le Page, is a classic. I wrote a comment, then found there are no comments, so here it is. Only the pronouns have been changed. As reference supporting the statement that “.. more than 100 per cent of the warming over the past century is due to human actions” le Page gives a link to – his own article. As reference supporting his statement that “more than 90 per cent of scientists agree climate change is happening and is largely due to people” he gives a blog article by John Cook citing a meta-study by John Cook which is in turn based on a number of other articles, by, among others, John Cook. John Cook’s original article didn’t ask any scientists what they thought, and is therefore not evidence for his assertion. As reference supporting his statement that there has been a “long-running misinformation campaign funded by fossil fuel interests” he cites a review of a book by scientist Michael Mann, “The Hockey Stick and the Climate Wars” in which this well-known climate scientist and litigation expert claims that he has been persecuted by critics funded by fossil fuel interests. Evidence of clear public support for action on climate change is critical to create the political will for a shift to a low carbon society – and that is just what this major new European survey provides. The reassuring thing about findings like these is that there has been no mass conversion to the storyline pushed by supine and activist mass media such as the BBC, and sundry other bentleft outfits. Of course, that reinforces their low opinion of ‘the rest of us’, including of course their despised voters for Brexit. ‘European Carbon Trading Scheme (ETS) could lose £1.7bn worth of UK funding once Britain exits the trade bloc. “The UK is one of the major contributors to this fund and after it leaves the finance for this fund will not be there,” Mr Duncan told The Independent. So, long may we the public have freedom to form our own opinions, and indeed to have the vote, without which we would not have the promise of Brexit to come, and of Trump in the present.. Meanwhile, in a deep dark corner of Wales, new scheming is no doubt underway to condemn our opinions as WrongThink and get them changed. But maybe the bright doves of free thought will not be cowed by the dismal pigeons squawking and pleading in the public square, and even in the once nobler groves of academe. The citizens of four major European countries think the impacts of climate change such as severe floods and storms are already affecting them, according to a major new polling study. The research dispels the idea that global warming is widely seen as a future problem, and also shows strong support for action to tackle global warming, including subsidies for clean energy and big financial penalties for nations that refuse to be part of the international climate deal signed in Paris in 2015 – as US president Donald Trump has threatened. There was also strong support for giving financial aid to developing nations to cope with the impacts of climate change. Overwhelming majorities of people in the UK, Germany, France and Norway said climate change was at least partly caused by human activities, such as burning fossil fuels. But only a third thought the vast majority of scientists agreed with this, despite about 97% of climate scientists doing so. I can well believe that climate change is not a high priority for the public. I think it would be even further down such lists were there better sharing of information about the subject. Not information from vested interests and their hangers-on, but information from critically-minded independent thinkers and analysts. “One book won’t catapult climate change out of the green margins and into the middle-England mainstream. But with 6500 copies sold (and counting), this is a book on climate change that might just reach the elusive ‘unusual suspects’. For a psychologist he really is delusional..
Barry I’ve come to the conclusion that this sort of person truly thinks a different way to the rest of us (including what facts mean if he thinks 6500 books sold is impressive or influential). For a person who finds it impossible to put themselves in another’s shoes, it’s bemusing he chose psychology as a field. How many copies of “A Short History of Time” were sold, how many were read to the end, and how many readers understood what had been written? His Royal Chas-ship has a long way to go. Sales can be misleading. Alan, I read the brief history all the way through but, after chapter 1, I had the impression that Hawking was a gunslinger entering a gunfight with a toothpick. He was revisiting a philosophical debate that has been going on for about 2000 years but without any knowledge of St Augustine or any other intellectual heavyweights who have trod this ground. The science bits were interesting. But his attempts to draw significance from them were odd, maybe embarrassing. He seemed to be saying that everything is indeterminate, which is not the liveliest of messages. I imagine his publishers hoped that people would buy Hawking and not read the book. (1) Unless they are highly motivated, people will not do the necessary research to inform themselves. And climate change is a complex problem with technical aspects. (3) The public takes hints from elite cues, but the previous Canadian government was committed to fossil fuel exploitation, and for a decade avoided discussing any environmental issues associated with the combustion of carbon-based fuels. (4) The worst effects of climate change have not surfaced yet. So people are not getting the experiential cues , and they overlook the uncertain impacts on the future. Anything Erick Lachapelle says needs to be treated with caution. He was one of the authors responsible for this completely garbled piece of survey reporting a year ago, in which they changed their story after their results were published. There is some sense in those points, but the bias and spin show through strongly, as is usually the case with people who do these surveys. LaChapelle misses the most obvious – fossil fuels are bloody brilliant. Coupled with there being almost no ‘experiential cues’ of man made climate change for the worse, people just aren’t worried. It’s funny how determined the psych brigade want rejection of AGW to be a political or ideological one rather than one of practicality. If renewables were as good as fossil fuels we’d use them happily. There might be a few petrolheads who stuck to their vintage cars but the rest of us would be zooming about in our electric cars. IF they were as good. We’d even be more concerned if the evidence wasn’t so flimsy. Short version: Americans are more worried about climate change since Trump’s election.